Chicago Trophies and Awards International, online at AwardsCo.com, is your source for recognition awards for all occasions. This store provides sports trophies, corporate awards, academic awards, all occasion awards, certificate plaques & frames, coach awards, chess awards, eagle trophies, military awards, personalized gifts, lapel pins, religious awards & gifts, Halloween awards, medals & ribbons, and so much more. Plus, AwardsCo is devoted to the highest quality merchandise and is available to work with customers to create custom-design awards to honor your accomplishments. Check out RetailSteal.com today for the best AwardsCo savings, AwardsCo discounts, and AwardsCo coupons, then head over to Chicago Trophies and Awards International and shop the award collection now. AwardsCo offers free ground shipping on orders of $100 or more within the 50 contiguous United States. See AwardsCo.com for more information on shipping destinations and rates. Use this coupon code on AwardsCo to save 15% on your entire purchase. Click to save. Get 10% off your entire order when shopping at AwardsCo and get free shipping with the coupon code. Click link to save. Members of the military, hurry over to AwardsCo today and use our coupon code to save 10% on all merchandise. Save 5% on your online purchase at AwardsCo when you use the coupon code. Click link for savings. Spend $100 or more and get free shipping at AwardsCo. Click link to save. Save up to 60% with the Deal of the Day at AwardsCo. Click link to savings. 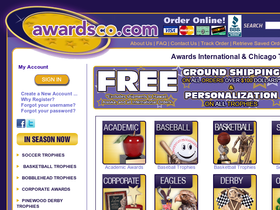 At AwardsCo, receive free personalization on all trophies. Click link to shop online. Pay only $3 for select trophies on sale online at AwardsCo. Click link to purchase. At Awardsco, get a Winners Cup Bowling Resin Trophy for only $4.60 when you shop online. Click link to buy. Buy custom shirts for as low as $4.95 at AwardsCo. Click link to order now. Buy a Rosewood Clock with Brass Accents and pay only $35 at AwardsCo. Click link to place your order. Enjoy a 15% discount on all surfing trophies from AwardsCo. Shop online at awardsco.com today and save!